The gloriously bright star Arcturus rises into your east northeastern sky around 9 p.m. tonight. 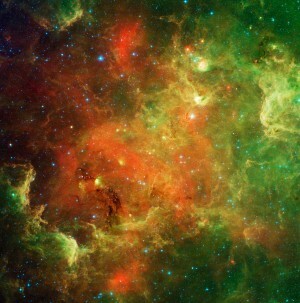 This yellow-orange beauty – like any brilliant star – sparkles wildly when it hovers near the horizon. 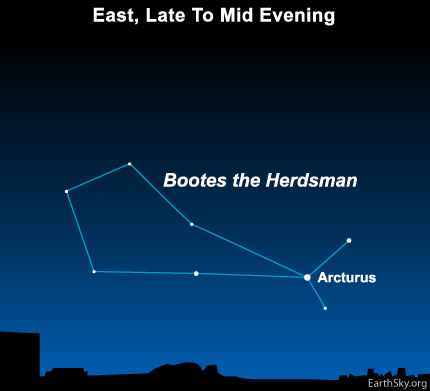 Arcturus is the brightest star in the constellation Bootes, which represents a Herdsman – though to our modern eyes, this star formation might look more like a kite or snow cone. Arcturus is the fourth brightest star in the night sky, after Sirius, Canopus and Alpha Centauri. Sirius shines brightly on winter evenings. The famous southern star Canopus does, too, as seen from latitudes like those in the southern U.S. Alpha Centauri is too far south to be seen from the continental U.S. Therefore, Arcturus is worth getting to know. It is not only bright but also – due to its northerly location on the sky’s dome – visible for much of the year for northern hemisphere stargazers. Arcturus’ appearance in the early evening sky is a welcome sign in our northern climes, because it heralds the coming of the spring equinox, or the first day of spring. After the equinox this March 20, the daylight hours will begin to surpass the nighttime hours in length. Arcturus, like any star, rises 4 minutes earlier every day. Soon, the earlier-rising Arcturus will first beam at dusk, instead of nightfall. Around the time that happens, spring will return to our northern hemisphere! Site contents copyright © 2019 Recorder Online	except as noted. All rights reserved. | 88 queries in 2.260 seconds.